You don’t just have severely damaged hair. Rather, it weighs on you like a responsibility, like a pet or a particularly needy plant. You wash it ever so carefully, condition it religiously, coat it in oils and serums and creams, and hope to God that it doesn’t get any worse. (Spoiler alert: it always does.) Products should be approached with caution, with ingredients lists carefully examined, and heat tools avoided like the plague. The struggle, as they say, is all too real. There are plenty of products that are geared toward extremely damaged hair types. Some are very, very good, leaving hair with the misleading appearance of health, and others are just alright, but none really work to address the issue; they just sugarcoat it. 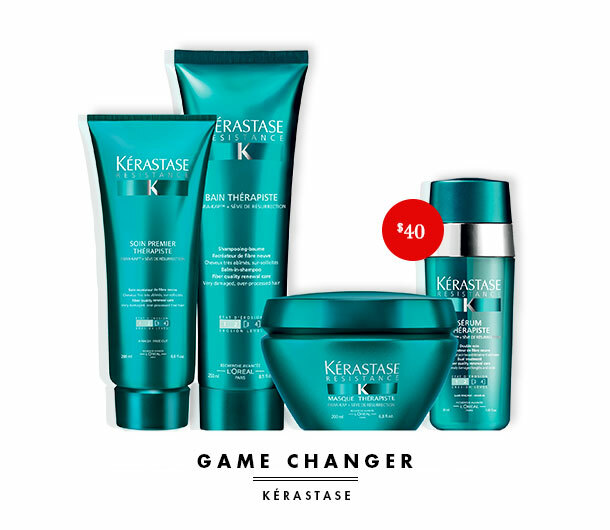 The Kérastase Résistance Thérapiste line wants to change that. It’s ambitious, for sure: the technology is groundbreaking, the science behind it convoluted, the claims lofty as anything. The gist is that it utilizes the sap from the Resurrection Plant, which reactivates the synthesis process and, uh, brings dead things back to life. No, seriously—we saw it in action as it revived a dead sprig of lavender, which bloomed into a lush green plant when submerged in water. The line’s four products were formulated to work the same magic on dry, dead hair. The regimen is a bit different, too: You use the conditioner before the shampoo, to hydrate and detangle hair before you cleanse, with an optional masque for deeper nourishment. It feels peculiar at first to approach cleansing and conditioning in reverse order, but the difference is noticeable. Even the most over-processed hair feels silky to the touch, and we noticed a significant reduction in the amount of hair that collected in the shower drain. For us, the star component is the shampoo. It has a thick, viscous texture totally unlike any other shampoo we’ve ever tried—it’s more of a balm than anything, and it really feels like it’s thoroughly cleaning the hair without stripping. That said, the entire line is made up of winners that have landed themselves a regular role in our hair care routines. It’s pricy, yes, but if your hair has really taken a beating, you won’t find anything on the market more effective and more suited to you than the Résistance Therapist collection. That, we think, is priceless.